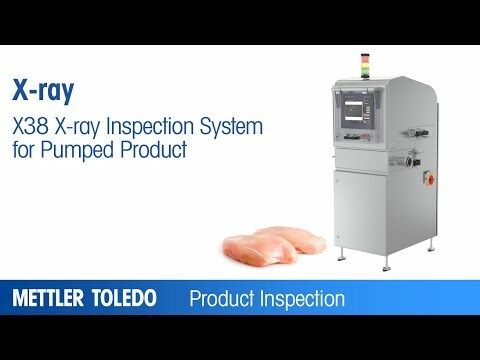 METTLER TOLEDO Safeline provides pipeline x-ray inspection solutions that are specifically designed to inspect pumped food products such as meat and poultry as well as slurries, semi-solids and fluids, at any stage in processing or before final packaging. Applications typically include sauces, jams, minced meat, molten chocolate and dairy spreads, as well as products that cannot be sieved - for example, textured fruit purées and yoghurts containing fruit chunks. Pipeline x-ray equipment delivers superior product safety for pumped food products through the detection and removal of physical contaminants such as glass, metal, mineral stone, calcified bone and high density plastic in the early stages of production. High accuracy x-ray inspection technology minimises the risk of product recalls, protects consumers from harm and safeguards brand reputation. 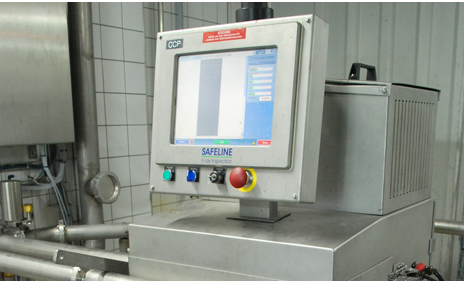 METTLER TOLEDO Safeline’s pipeline x-ray equipment offers high throughput, automatic calibration and a hygienic design. Throughput for slurries, semi solids and fluids is up to 18 tonnes per hour while meat and poultry products can typically be inspected at around 9 tonnes per hour. Pipeline x-ray systems are designed to automatically adapt to changes in the product flow rate and can adjust the scan speed as well as the associated reject timing to align with the speed of the production line. Physical contaminant detection levels are typically improved in the early stages of the production process where unprocessed food can be presented in a shallower depth and with a more uniform (homogeneous) texture. 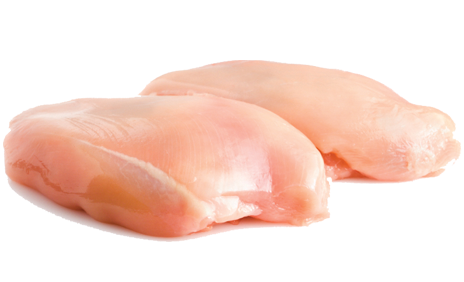 Removing contaminants, such as bones in chicken products, early in the production process reduces product waste and lowers costs. What are the benefits of using x-ray inspection systems for in-line pumped food products? Physical contamination detection levels are better in the early stages of the production process where unprocessed pumped food product can be presented in a shallow depth. Installing an x-ray system early in the production process allows manufacturers to monitor suppliers' quality control. This can help to save time and money by preventing damage to downstream processing equipment and removing contaminants before further value is added to the product. 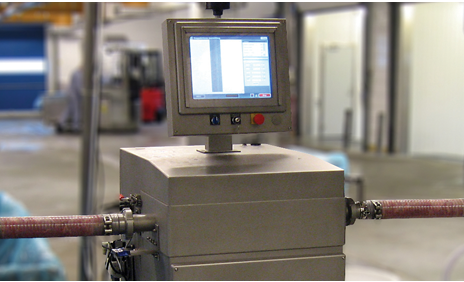 How can a pipeline x-ray inspection system be fitted into an existing production line? Connecting x-ray inspection equipment to an existing piped production line is straightforward. Standard fittings are used to attach the pipe (through which the pumped food product passes) to the manifold of the x-ray machine. How do x-ray systems reject pumped food product from a pipe? Many reject valve types are available. Making the right choice is dependent on the product application. For slurries and sauces, a three-way diverter valve is usually the most effective reject mechanism. For meat and poultry processing, where solid cuts of meat will be in the product flow, a slicing valve is usually the preferred choice. The selection of valve will also be dependent on the temperature of the product and whether it needs to be a clean-in-place (CIP) or aseptic line. Which pumped food applications are suited for pipeline x-ray equipment? Pumped food products such as meat and poultry, liquids, slurries and pastes tend to be homogeneous which makes them an ideal application for x-ray inspection. 3” or 4” (75mm or 100mm) as standard. How can the performance of an pipeline x-ray system tested? For pipeline x-ray equipment containing liquids, slurries and pastes, test samples should ideally be placed independently in the product flow. The reject device should then be observed to successfully reject the test sample. The test sample should be encapsulated in a colored material that is different to the product, making it easily identifiable in the rejected product. To verify that the reject timing is correct, the test piece should be located in the center of the rejected product. The test should be repeated, typically three times. What throughputs are achievable with pumped applications? METTLER TOLEDO Safeline X-ray systems for the inspection of pumped products offer high throughputs, automatic calibration and hygienic design. Throughput for slurries, semi-solids and fluids can be up to 18 tonnes per hour. Meat and poultry products can typically be inspected at rates of up to 9 tonnes per hour. When is it more effective to use an x-ray system to inspection product? When it's in-process in a pipeline or at the end of the process or production line? What is the hygiene rating for a pipeline x-ray inspection system? All METTLER TOLEDO Safeline X-ray pipeline systems are designed to IP69 as standard. Slopped and curved edges allow for water to roll off the system whilst the IP69 air conditioner meets the demands of high pressure cleaning in harsh manufacturing environments, avoiding bacterial growth.